Cairns, or the Gateway to the Great Barrier Reef as its affectionately known, is fast becoming the most popular cruise port destination in Queensland — and for good reason. With the GBR on its proverbial doorstep, Cairns is a premier destination for sailing, diving and snorkelling, and the city itself isn’t so shabby either. Starting life as a sleepy sugar-milling town, Cairns has since become a mecca for marine activity, and is often voted among the world’s best destinations for scuba diving opportunities. 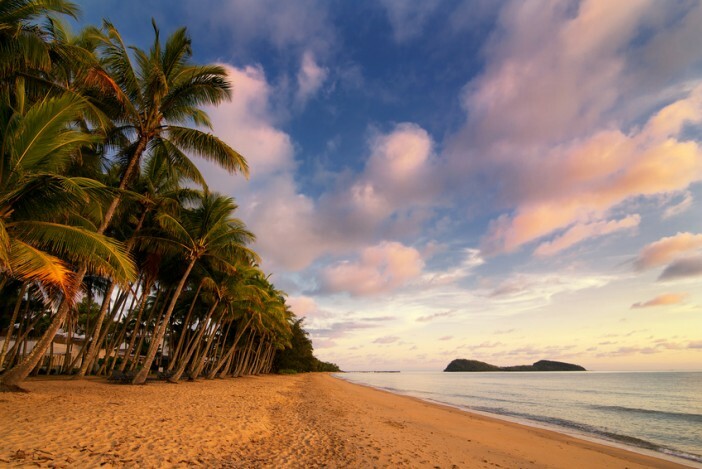 Put aside its connections to the great reef however, and Cairns has a colourful history and heritage dating back to the time of the Aboriginal and Torres Strait Islander people. With trips to Cairns included on most Australian cruise itineraries, we’ve put together this city guide to help you make the most of your time spent in this tropical city on the flanks of the Pacific. If you intend to make the most of Cairns tropical climate during your visit, make for Trinity Beach — arguably the best place to lay your beach towel in the city. Flanked by palm trees and stretching for well over a mile, Trinity is paradise-found for the ardent sun seeker who wants to relax away from the hubbub of their cruise ship. Trips to Green Island can be booked in Cairns harbour, and we’d certainly recommend paying the price to witness this petit patch of utopia. Located in a prime position atop the Great Barrier Reef, Green Island is probably one of the most photographed isles in the world thanks to its pristine teal waters and white sand shoreline. Travel west from Cairns, and you’ll stumble upon an area of Australia famed for its lush natural beauty. Hidden amid the tropical flora is the Behana Gorge Waterfall, an area of outstanding natural beauty that’s become a renowned hiking spot. If you’re brave enough, why not bring your swimwear and join the other brave souls bathing in the falls’ chilly freshwater pools? It’s the perfect way to cool off. Topping many a wanderlust list and providing a true once-in-a-lifetime experience — snorkelling at the Great Barrier Reef is an absolute must-do during your visit to Cairns. The city’s harbour is home to dozens of dive tour operators happy to take you out to the reef — for a hefty price of course. Most cruise lines visiting Cairns operate their own GBR snorkelling excursions, so we’d recommend booking one of those. If you prefer life spent at a more leisurely pace, a great way to take in the beauty of Queensland’s tropical north is with a ride aboard the Kuranda Scenic Railway. Traversing the stunning Macalister Range between Cairns and the neighbouring town of Kuranda, this fantastic scenic railway passes through a UNESCO World Heritage protected rainforest that’s millions of years old. One attraction to emerge as one of the city’s best thrills is the Cairns Zoom and Wildlife Dome. Housing a handful of exhilarating zip wires which criss-cross a gigantic spherical glass dome, the Cairns Zoom centre lets big kids hurtle over pools filled to the brim with man eating crocodiles and deadly snakes. Naturally, this isn’t for the fainthearted. Bringing a touch of Parisian charm to the stifling streets of Cairns, C’est Bon is a French-themed bistro serving up an array of surprisingly authentic Franco cuisine. Ignoring the rather tacky miniature Eiffel Tower on its roof, C’est Bon does offer great food — from sautéed scallops to Chateaubriand. For those with an adventurous palate, Bagus Café serves up a wealth of faithful Indonesian cuisine amid charming and authentic surroundings. The restaurant is famous across Cairns for its delicious Goreng dishes, which comprise a mix of fried rice, vegetables, spices and a choice of meats. If you’d prefer to stick to what you know and love, head to Cairns waterfront promenade and enjoy a feast at the Waterbar & Grill Steakhouse. Serving huge cuts of prime beef and pork, this all-Australian restaurant is a great choice for those feeling peckish after a hard day of snorkelling or sightseeing. If you’re yet to book a trip to tropical Cairns, visit the Cruise1st Australia website where you’ll find a great selection of Australian cruises which visit this unforgettable port destination. Alternatively, give our customer service team a call on 1300 857 345.